Barrowing still accounts for a large quantity of our deliveries. 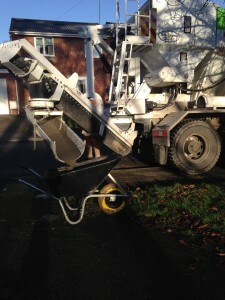 We carry 2 wheel barrows on each truck which are free for Eco Concrete customers to use upon delivery. If you are considering using our barrowing service it is helpful to know that there is an average of 20 barrows to the cubic metre. If you would like assistance with your barrowing please inform us when you place your order and we will be able to give you a quote for this service.